Than you gotta buy this one. blowback pistol that shoot hard, good looking, and excellent value. If they fix that rattling sound under the barrel (you will see that loose piece that the pin go thru under the barrel once you remove the slide), make the trigger lighter, and use a better spring for the slide... this would be a perfect gun. 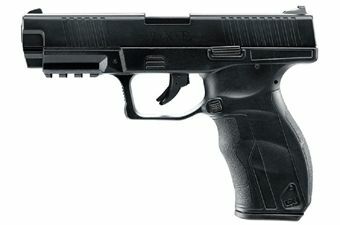 it be difficult to find best quality price then this pistol. the construction is great perhaps the slide appear a little slack but the metal of this one are great and the weight is nice. the blowback effect are very snappy and the slide locking after the last shoot is very realist.the accuracy at approx 15' are in a great average but not exeptionnal. so for the price is so good. co2 consumption are great for a blowback pistol, above 100 shoots.i realy like this gun !il serait difficile de trouver meilleur qualité prix. la contruction est bonne. meme s il est solide la cullasse semble un peu lousse mais le metal de celui ci lui donne un effet et un poids tres agreable.l'effet blowback est tres reussi et donne un tres bon "kick" et avec le fait, que la culasse reste barré en arriere apres le dernier coup, cela donne beaucoup de realisme.la precision du tir a 15' est dans une bonne moyenne sans etre exeptionnel. mais pour le prix elle est tres bonne.le consomation de co2 d environ 100 tir ou un peu plus est bonne pour un arme avec blowback.j aime vraiment ce fusil ! Is fun but not very acurate overall worth the money. Is alot like a glock. Very good quality, the plastic of the body is not chinese, the slide metal is great, look a lot like a G..... accurate even for a DA that is not so hard, 100 shot's or so per CO2. Only draw back is the slide/blowback that is decorative, that's why the spring is so weak. I do recommend it specialy at that price, you can't go wrong.